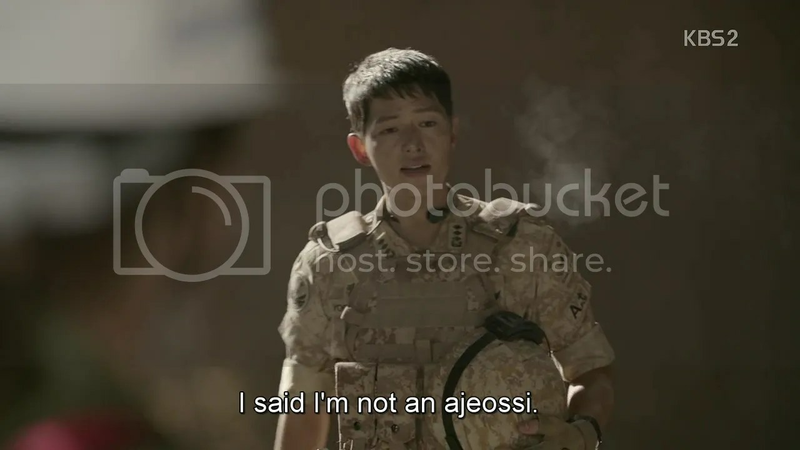 Moyeon doesn’t respond after Shijin confesses that he’s serious. He waits for a few moments before ruefully sighing and getting to his feet. He asks her to rest a bit; he’d walk her back but he has to report back for a briefing. She says he has to make one. He doesn’t ask, but talks her there and listens to the brief while watching her stare at the phone and hesitate repeatedly. She finally decides to pick up the phone and makes her call. It’s to Manager Go’s wife. Moyeon tears up as she informs her of her husband’s passing, remembering Go talking about how his wife and him had spent more time apart than together. Each saw each other’s pictures more then each other. And now, she’ll have to spend the rest of her life looking at a picture. He asks her not to stay alone for too long. Moyeon can barley keep from crying as she relays his last message. Shijin just watches her wordlessly. Ja Ae finds Sanghyun sadly looking at a wedding ring he had to remove from a man who’s left hand he had to amputate. She goes to the patient and strings it around his neck instead. Sanghyun looks more besotted than ever. Speaking of besotted, Yehwa helps Daniel fix his car, while trying to make him give the British journalist an interview. She promised them the interview in exchange for blood. She hops down and mutters that she’ll check what’s for lunch. He watches her leave with a smile. Sanghyun, Chihoon and Minji come out then and note Daniel working. They discuss him back at the Medicube and Chihoon, however, is a huge fan and fills them in the details. They wonder why he’d pursue such a dangerous profession if he was so rich. Sanghyun’s inclined to think it’s because he seeks out trouble (but I’m inclined to think that he has a heart of gold). Meanwhile, Shijin follows a weeping Moyeon as she walks back. She doesn’t want him watching her cry and asks if there are any dark places with no one around. Shijin jokes that that’s what a man usually asks. He tries to make her smile and succeeds. She sighs that the heavens sure are shameless, looking so beautiful when there’s so much destruction on earth. Shijin sighs that he thought it would be comforting but she responds that she already received comfort, from him. Meanwhile, Jin Youngsoo gets beaten up by Argus who gives him one more day to hand over the diamonds. Or else. He hurriedly agrees. 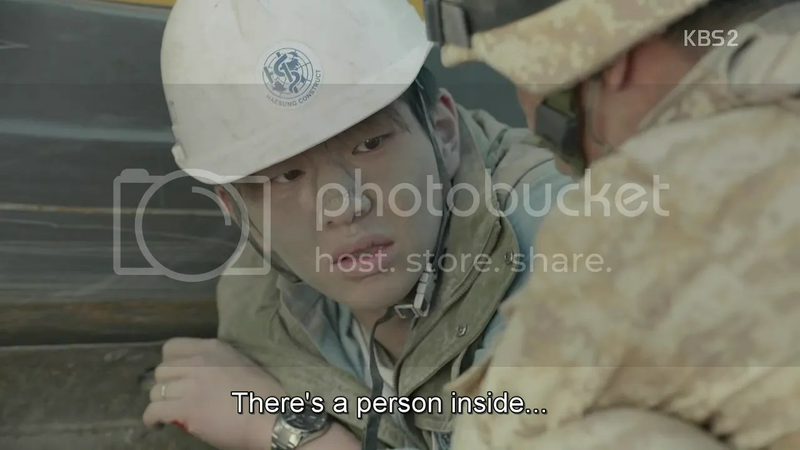 Argus must have come to the fallen power plant to beat him up because the camera pans several floors down, where Kang Minjae (the young labourer who always slept on the job, and who saw Youngsoo stash away his diamonds) weakly calls for help. A forklift’s brought in the next day and Youngsoo is delighted, thinking that they can finally drill to his office, but Daeyoung calls stop. There are still three people missing and they’re presumed alive until found. Youngsoo yells that they should just be considered dead given how much time has passed but Daeyoung and his team aren’t giving up. If it’s not possible, they’ll make it possible. The search party goes in, among them is Chihoon who wants to help too. He wanders a way off and finds Minjae, a floor down, separated by a sheet of glass. He’s about to call someone to help him when the building starts to shake again. Myeongju and Kibum are manning the seismograph and know it’s aftershocks from the earthquake. The glass shatters and Chihoon reaches out to help Minjae. 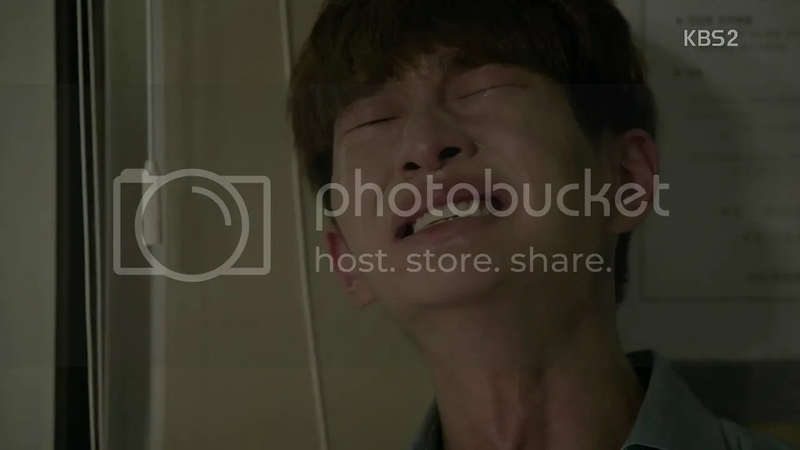 The latter grabs up and Chihoon strains to pull him up when a block of concrete falls from the ceiling, hitting Minjae’s shoulder and breaking Chihoon’s fingers. He panics and runs, apologizing all the while. He stumbles outside, dazed and covered in ash and can only shake in shock when a soldier asks if he’s alright, mumbling over and over that there’s someone still inside. Daeyoung entrusts Kibum with blowing a whistle and warning everyone if the tower tilts by more than 10 degrees. He prepares to head out when Myeongju arrives and asks if he’s okay. He answers that he is. She asks to take his hand for a second, and twists it. She bandages his hand, and he takes it quietly. 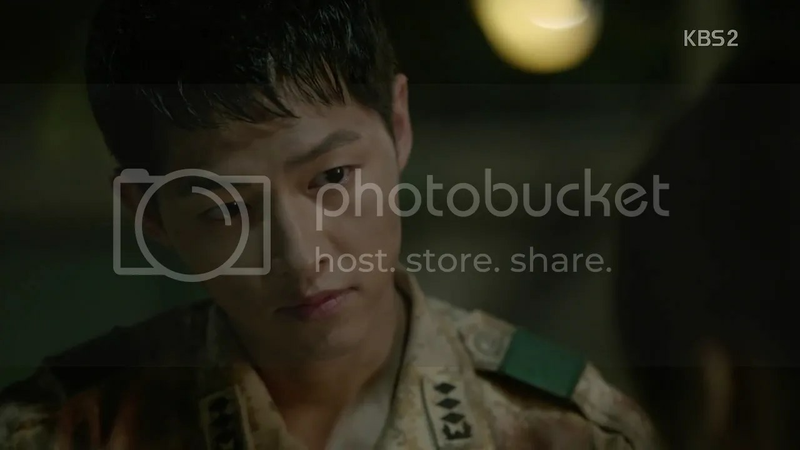 Shijin prepares to go in to rescue Minjae. Moyeon wants to come along but she isn’t trained the way the soldiers are and he asks her to stay but help him with a medical kit. She even labels the medicine in English. He tries to brag that he was the first in his class at the military academy at West Point but she isn’t listening to any of it. He gives up. He leaves with a smile, while she just looks worried. They find Minjae just fine. He’s very talkative and extremly pessimistic, and he calls them both ‘ahjusshi’. They discover that he crawled in through a tunnel that linked the east and west sides of the building. He’s presently half trapped (though not crushed) and Daeyoung works a hydraulic pump, trying to lift the concrete enough for him to slip free. 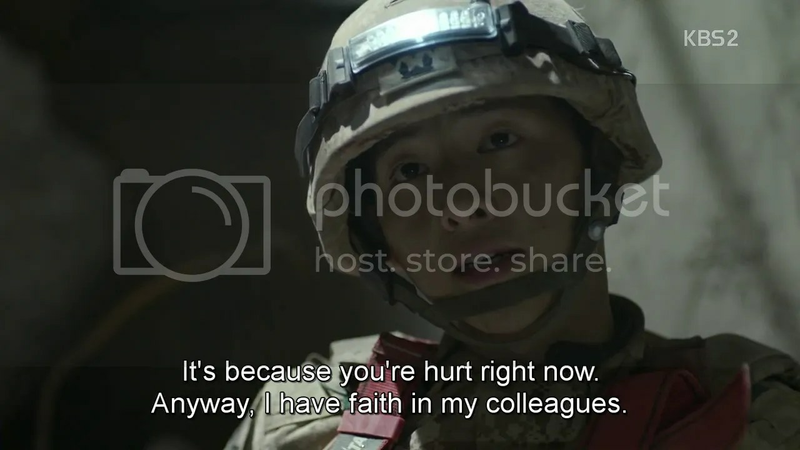 Meanwhile, Shijin transmits the extent of his non-threatening injures to Moyeon who says he just needs an IV and painkillers. She and Minjae both wonder if he’s capable of finding the vein which gets him wondering why everyone’s doubting him today. Daeyoung who’s been working hard at pumping all this time decides that this’ll take forever unless they get two pumps. He proposes that one of them should go get one and Shijin’s instantly certain of who it should be. Off Daeyoung goes. 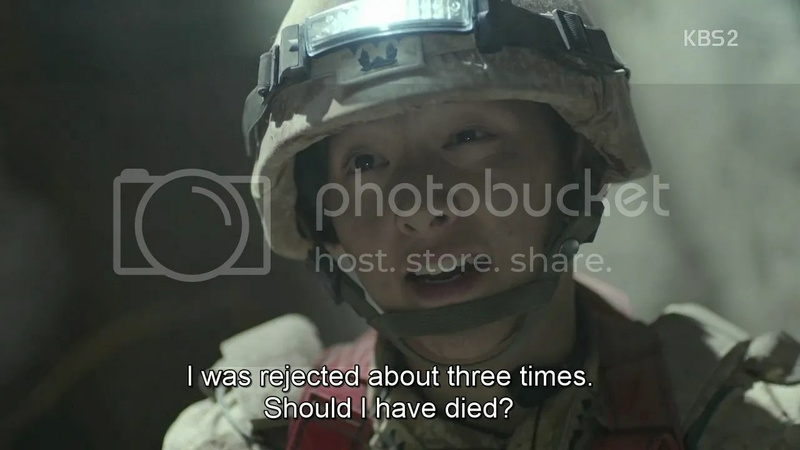 The highly pessimistic Minjae asks if a lot of people have died and Shijin quietly tells him that some did, but some were also rescued. Like him. Of course the kid has to whine about how he’s not saved just yet. Minjae suddenly starts getting itchy and it turns out he’s allergic to the NSAIDS in the IV. It’s not life-threatening but he requires epinephrine. Myeongju sends it via Daeyoung, who muses that the structure sure is shaky. The ground begins to shake violently right then. Moyeon, Daeyoung and Myeongju stare wide-eyed before Daeyoung spins to action and commands the people there to tell them what’s going on. Turns out, Youngsoo’s jumped into the forklift and begun tunneling on his own. Like a madman (scratch that he is one), he violently crashes through the building. Inside, Shijin wonders what’s going on but a block of concrete falls from the ceiling and he instinctively hunches over to protect Minjae. They fall further. Then, silence. 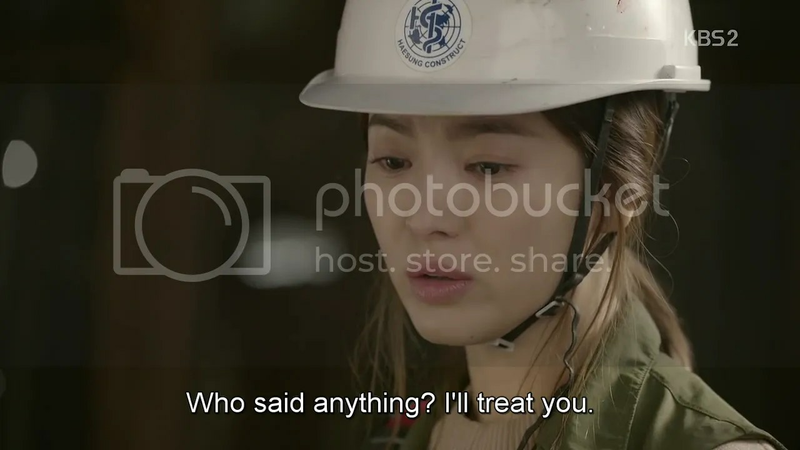 Myeongju repeatedly calls into the walkie-talkie asking Shijin to answer, only to receive no response. Youngsoo is dragged away as per orders. Whew! 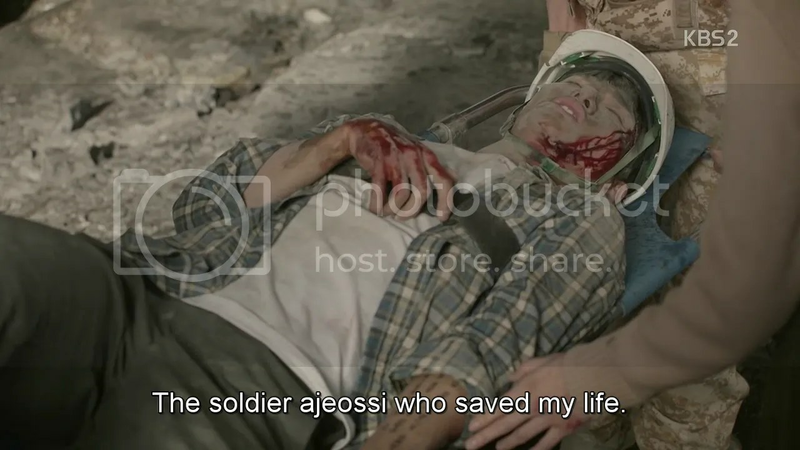 Minjae points out that his wrist is bleeding but Shijin makes sure that he’s alright first. His walkie-talkie is broken and the kid keeps yammering about how they’re going to die. 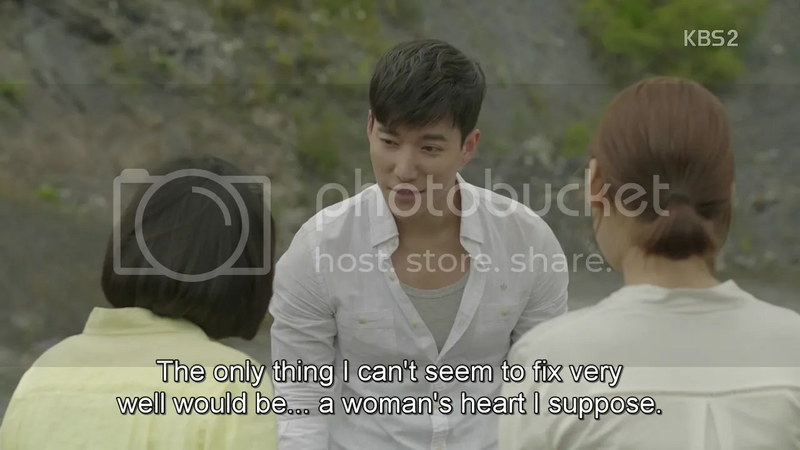 Shijin tells him to keep his spirits up for his girlfriend, but he doesn’t have one (not surprised). 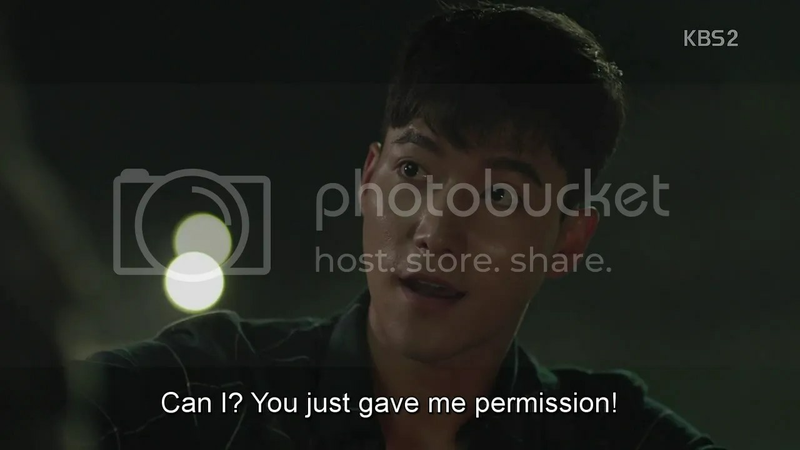 Minjae asks if Shijin has one. Shijin asks if he remembers the voice of the female doctor he spoke to over the radio. The kid mutters that if it was him, he’d be dead of embarrassment. Shijin just smiles. Back by the radio, Myeongju tries to assure Moyeon that Shijin’s fine. Moyeon ties her shoes, remembering when Shijin did the same for her and said he was relieved she was safe. In the present, she hopes the same for him. 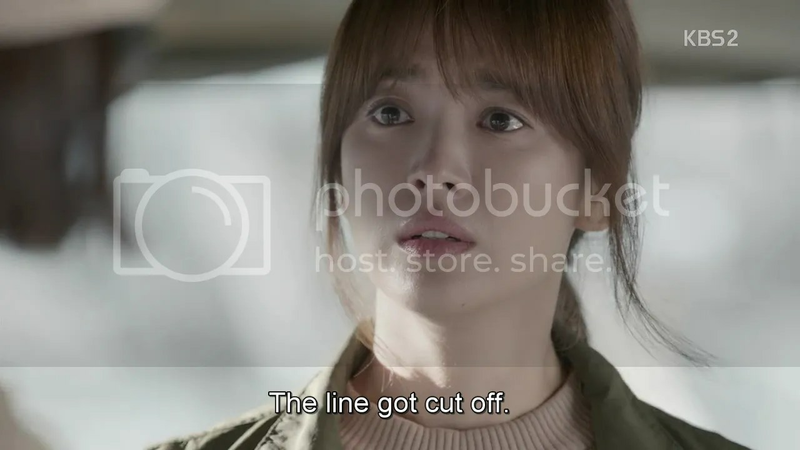 Shijin, on the other side, knows her too well and predicts what she’s thinking: that he’s dead, that she should have accepted his confession while he was live. He writes Minjae’s chart on his arm, just as he did with Kibum in the first episode, in the event that only one of them can be saved. He makes a pun about it (yak = medicine, manyak = in case) but it goes right over Minjae’s head. His throat starts getting itchy, as part of the allergic reaction, and he whines that he’s going to die. Just then the rocks blocking the entrance clear. Guess who? Minjae is brought out on a stretcher, Chihoon watches from a corner looking traumatized as hell and hating himself. Moyeon’s immediately on the scene and notes the chart on his arm. She remembers Shijin having done the same and asks who wrote it. Moyeon wordlessly watches as he nears and asks for another stretcher. Myeongju wonders if there’s another survivor but Shijin mutters that it’s for him. He climbs in and pauses before reminding Myeongju that she owes him one. Myeongju rolls her eyes but goes with what she knows he wants. Youngsoo barges in right then and yells that everyone seems just fine to him just as Daeyoung emerges from the building. He decks him as hard as he can and has to be held up from going further. The next thing you know he’s pouting at Mooyeon. She purposefully ensures that her treatment stings. Shijin mutters about it, and the fact that she’s been silent for so long. Moyeon wonders how he can joke about almost dying. He says he went in trusting her not to leave him to die. He assures her that he’s good at his job, part of that includes not dying too. 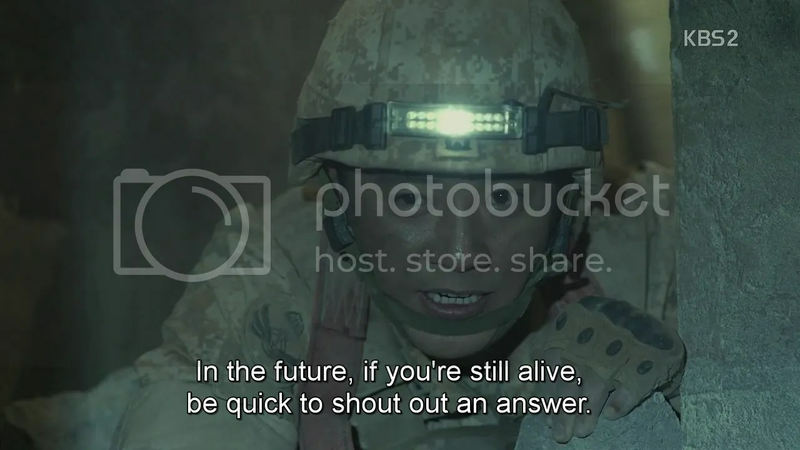 Kibum rushes in then announcing that the Lt. Colonel wants him for a report. 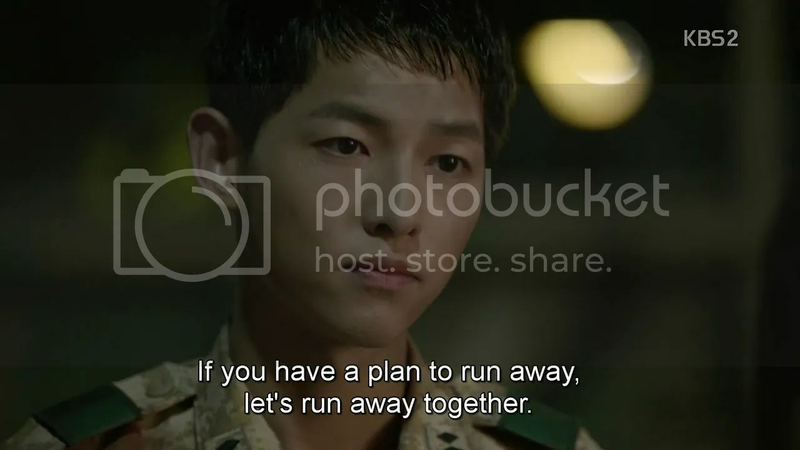 Shijin’s ready to dash away but Moyeon order him to stay put. He’s in need of rest. The colonel can come here if he wants a report that badly. 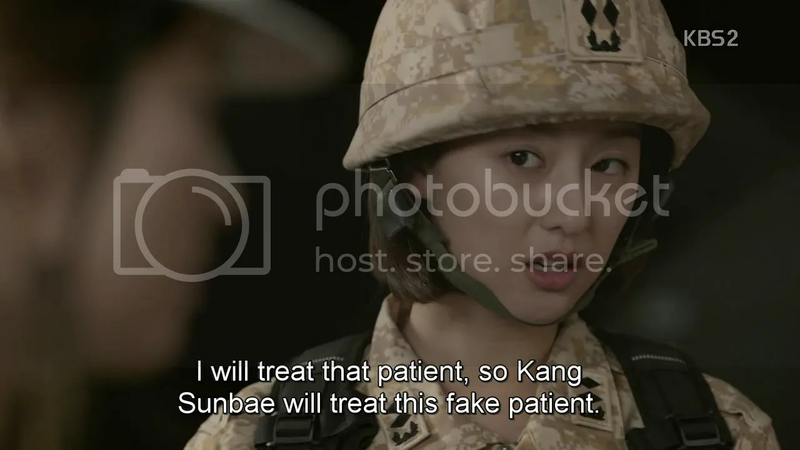 Shijin wonders if she wants him to get in trouble but obeys her orders. The next thing you know, he’s sitting in bed facing the colonel. Haha. The colonel informs Moyeon that Haesung hospital is sending in a plane to bring them back and to make a passenger list. They leave the day after tomorrow. 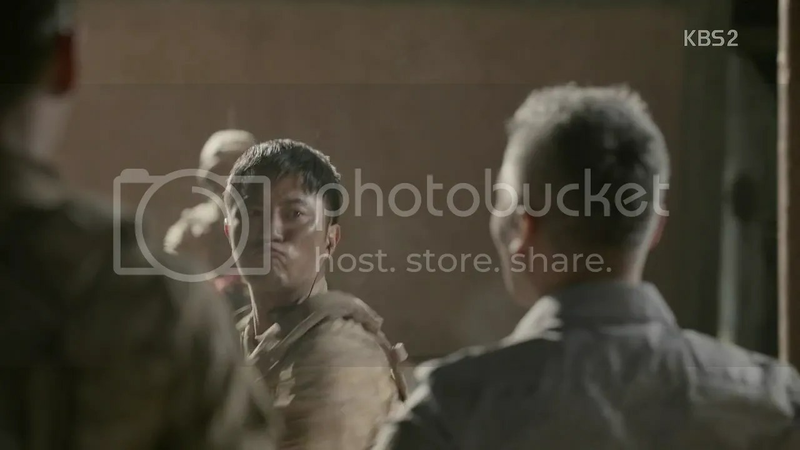 Shijin and Moyeon look awkwardly at each other until Youngsoo barges in and interrupts. Turns out Daeyoung decked him real good and he’s here to complain. He yells that he’s going to sue them with everything under the sun. The colonel listens calmly before agreeing that they should take care of it according to the law. He’ll be sure to file charges against someone who was at a restricted military site and nearly killed two people due to personal interest. He’ll have to stand trial for attempted murder as well. Youngsoo smirks that he isn’t a soldier, so he can’t be brought to military court. 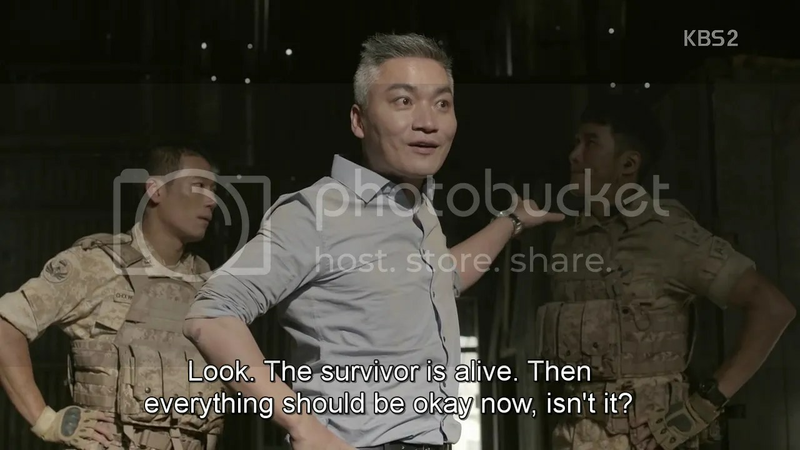 The colonel shrugs, noting that there’s nothing Youngsoo can do without implicating himself, and sends Shijin, Daeyoung and a corporal who just happened to be there and got roped into all of this to 100 laps. 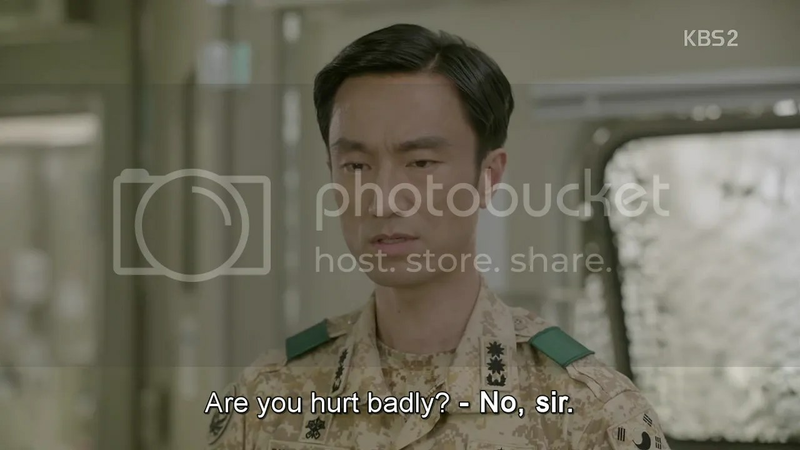 The sequence is utterly hilarious with Daeyoung and Myeongju insulting Shijin, but placing their insults in such a manner that Shijin wonders if they’re referring to him. After seven laps, he proclaims that they’ve done 27, which Daeyoung thoroughly agrees with. 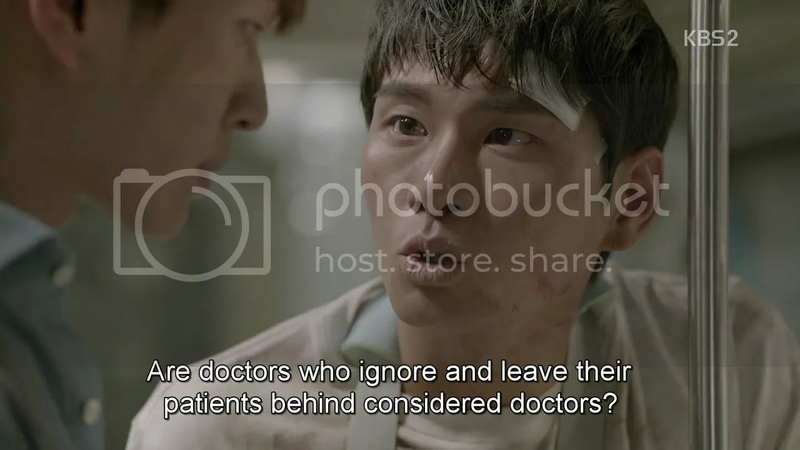 Right then, Shijin spies Moyeon and rushes off to get some advice from “his doctor”. Daeyoung just waves him along. Moyeon notes that he’s running laps despite not having done anything wrong and lightly criticizes the military’s inflexibility. Shijin doesn’t mind, preferring that rules exist. 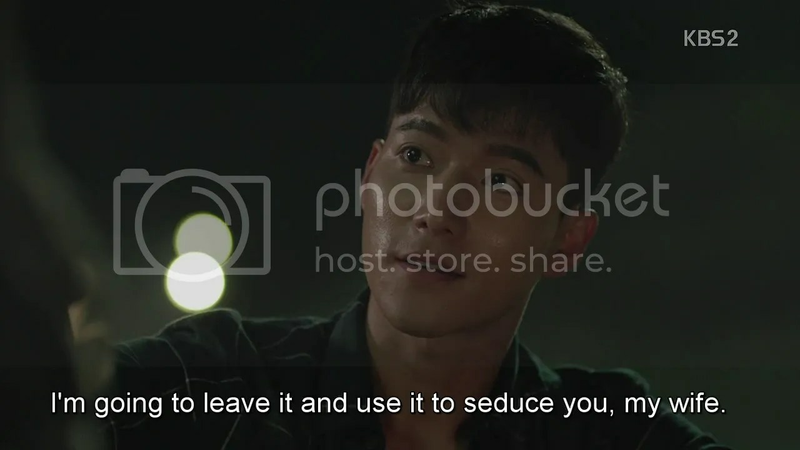 Moyeon just wants him to stay alive and hands him some medicine. Moyeon says she’ll hand over the list of the medical personnel leaving on the plan tomorrow and Shijin pauses. He asks if she’ll be leaving as well. Moyeon quietly says that it’s her chance to leave him now, but doesn’t directly answer and leaves. She asks the other doctors over dinner to raise their hands if any of them wish to stay. Ja Ae makes up her mind instantly, asking her seat to be given to a patient in need of an MRI. Minji follows suit. Moyeon’s proud of her team, but tells the other doctors that there’s no problem if they leave either. Some of them chose to leave, Sanghyun stays the instant he hears that Ja Ae is. Moyeon notes that someone’s missing though. 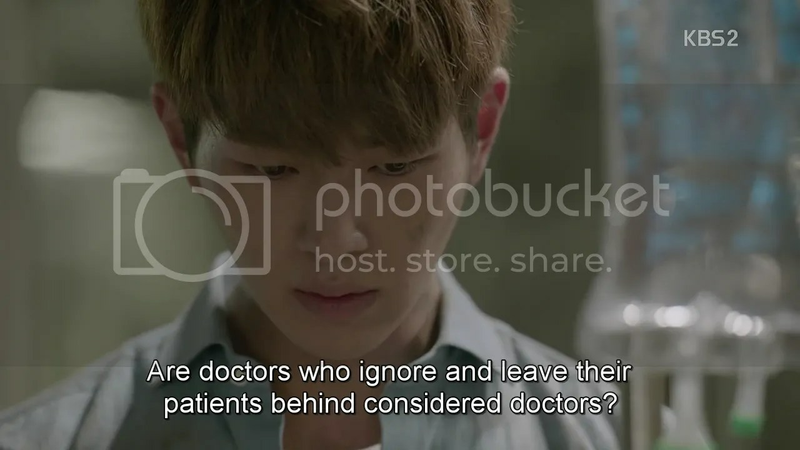 Chihoon’s in the hospital, silently watching Minjae. 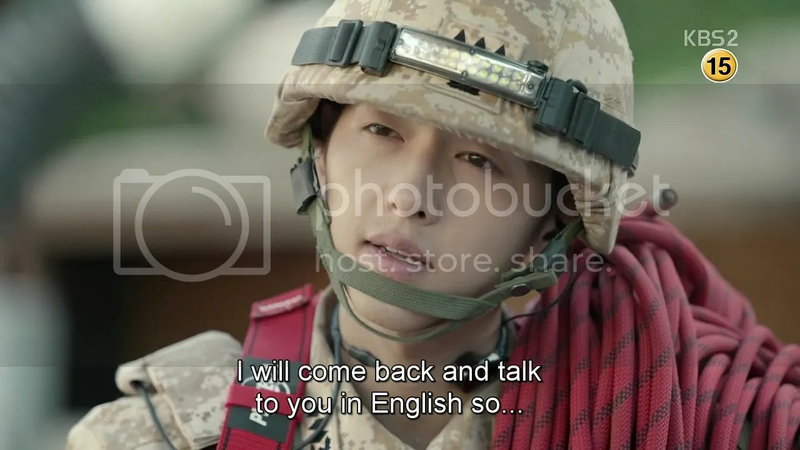 He turns when Minjae looks his way, but not fast enough. Minjae hobbles over and sardonically notes that he was supposed to be a doctor. (Poor thing) He leaves just as Moyeon comes in and commends Chihoon on having found Minjae. She says he put him on the list of departees, seeing as his wife is to give birth soon. Chihoon barely restrains himself from crying when Moyeon notes that his hand is injured and treats it. Minjae receives a nasty shock of his own upon discovering that Manager Go is dead. He sobs, clutching the fatality list. Chihoon watches him and weeps as well. A vigil is held the next day for the departed. The rescue mission at the power plant has officially ended. Youngsoo nastily cuts in muttering that this is his ground and he can do whatever he wants with it now and freaks out when a siren blares. 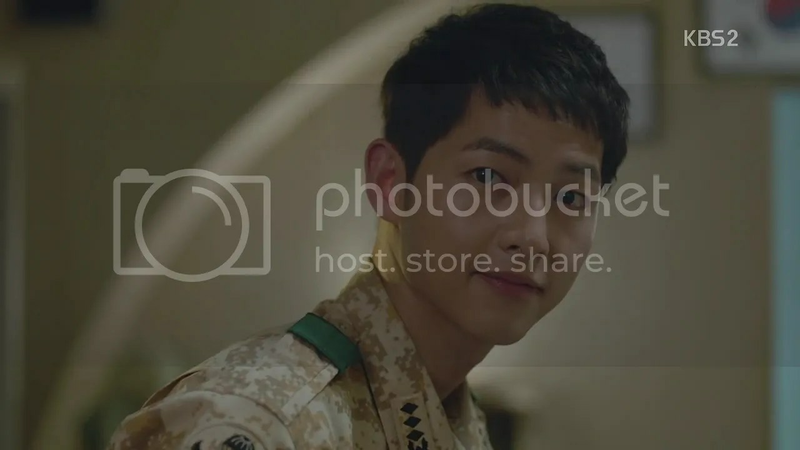 Shijin ignores him and quietly informs all the soldier and members of the medical team that an earthquake occurred here four days ago. Everyday onwards a siren will blare at this point to commemorate the fallen. They all take a moment of silent. 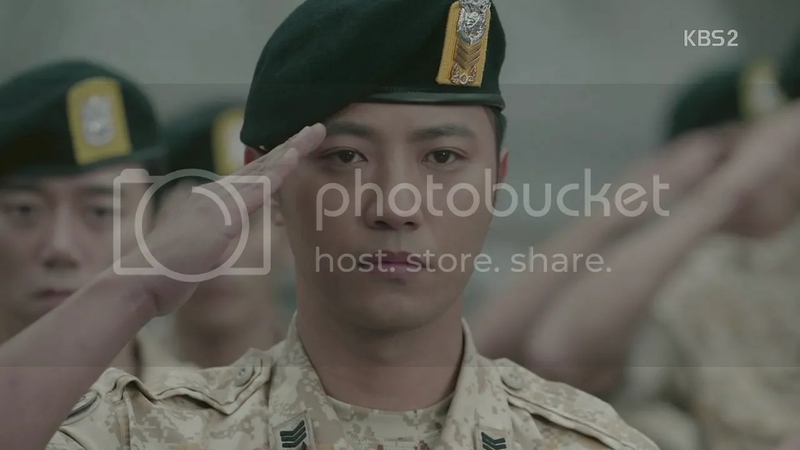 The soldiers salute; the doctors bow. Back at the doctors’ camp, Sanghyun muses on the meaning of life and flirts with Ja Ae in front of the others, earning whistles at the lunch table. Right then, wireless communication is restored and everyone’s phones ring and ping. Kibum rushes in too late to make announcement and looks like a sad puppy. Moyeon makes a call to Jisoo to assure her that she’s doing well and has decided to stay back. Jisoo muses that the broadcasting station is panicking without her but is proud of having such a heroine as a friend. Aww. The two friends chat, until Jisoo asks her to make Chihoon pick up his phone, his wife is worried as hell. Chihoon sits on his own, crying and ignoring his constantly ringing phone. Meanwhile, Minji and Ja Ae drools over Daniel. Can’t blame them. What a hunk. They bring over a computer for him to fix and he muses that he’s good with fixing pretty much everything. Sanghyun sees this and hilariously flips out. 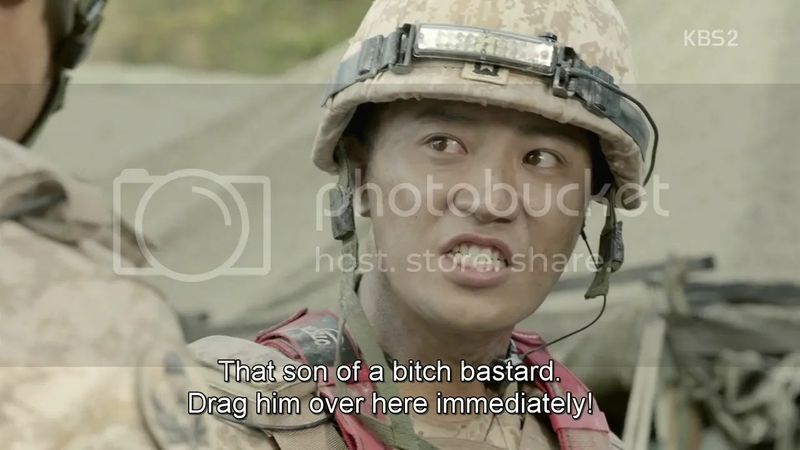 Back at camp, Shijin notes that Daeyoung hasn’t called anyone. Perhaps because the one person he cares about is here. Myeongju comes in right then saying that her father wants to speak to his ‘son-in-law’ only to pause at seeing Daeyoung there. 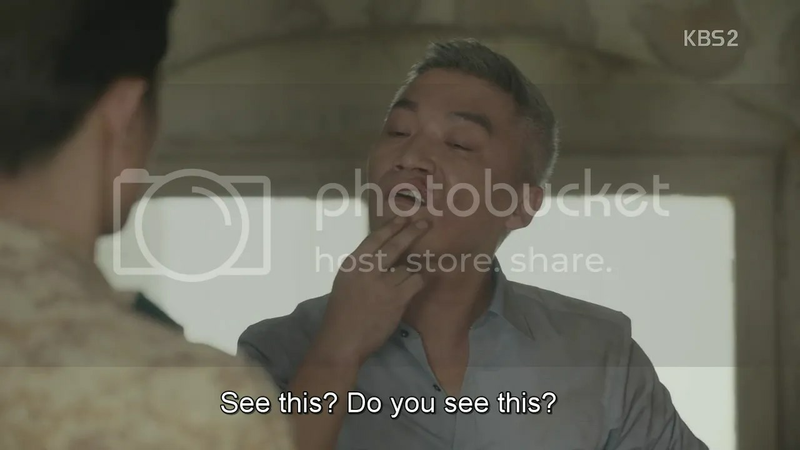 She hangs up on her father immediately while Daeyoung gives Shijin the evil eye and asks him if he and Myeongju messed around like that in his absence. 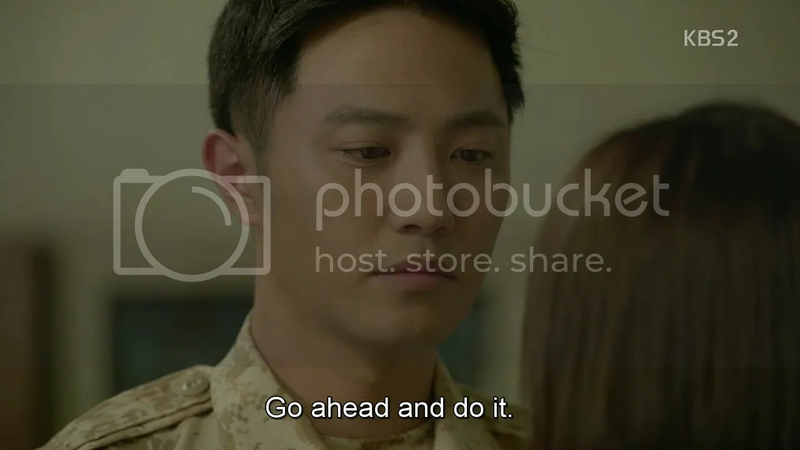 Myeongju’s delighted at his jealousy, while Shijin’s upset that Daeyoung’s picking on him instead of Myeongju. He leaves on the pretext of treating his wounded heart (haha!) leaving Myeongju and Daeyoung alone together. Daeyoung’s still jealous but Myeongju’s flirty. Daeyoung asks what she’ll do if he gets jealous and she promises him a reward. In the other room, Daniel’s managed to fix the speaker system, saying that music does wonders when he treats his patients. Moyeon broadcasts a love song on her phone and patients, doctors alike smile at the sound. Myeongju nears Daeyoung and asks him to go for it, considering the current mood and the fact that they’re alone. He appears to be considering it but backs out last minute and runs. Shijin sits with Daniel and asks what the next song is. Daniel shrugs, saying that it’s off Moyeon’s playlist. Only the next song isn’t what she planned. It’s the audio recording she made back what she was trapped in the car on the cliff. In it, she weeps, unsure of if he’s on his way. Moyeon races back to the room, dying of embarrassment. She freezes upon entering, Shijin grins. He’s never going to let her live this down, is he? OMG! Game changer at the end! This show has it all. Great recap, love to see their expressions. He’s already at full force with some reservation when she rejected him! Imagine now that he knows she likes him too but just trying to act like she doesn’t! 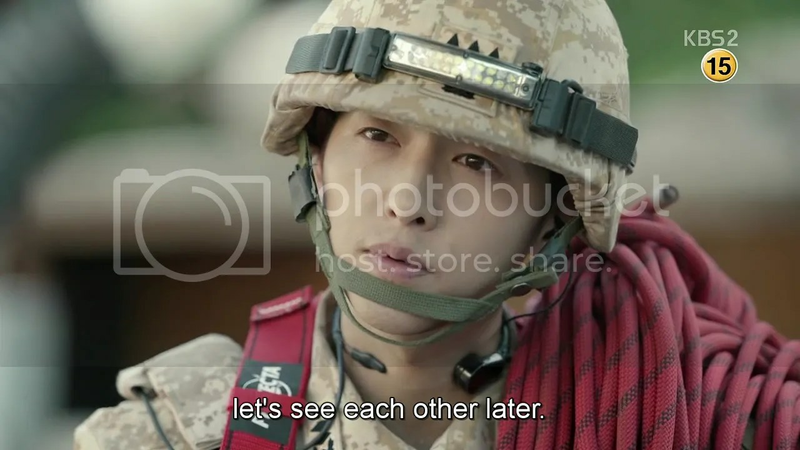 I just love YSJ, or to be more precise, I just love the way SJK plays YSJ. Thanks for the recap. 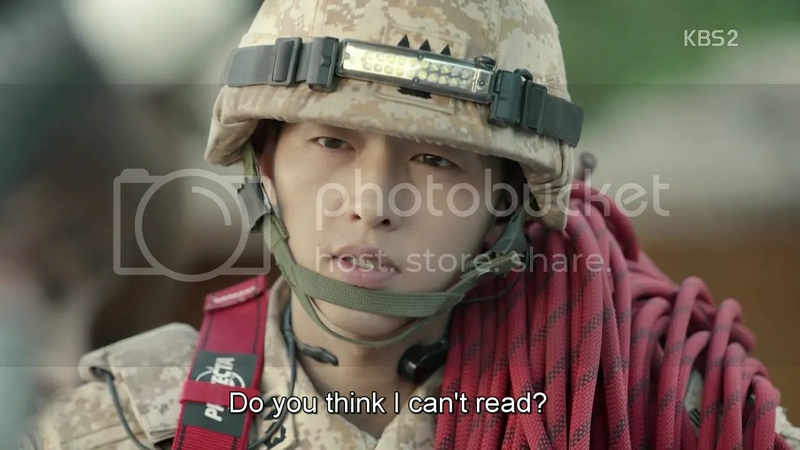 The ending had me squealing like the fangirl i am when it comes to Song Joong Ki. Whats not to love about this show? I’m digging the ost. Every single song! I’m onboard again after last weeks ending spoilers almost killed my spirits. Im going to love this show no matter what!